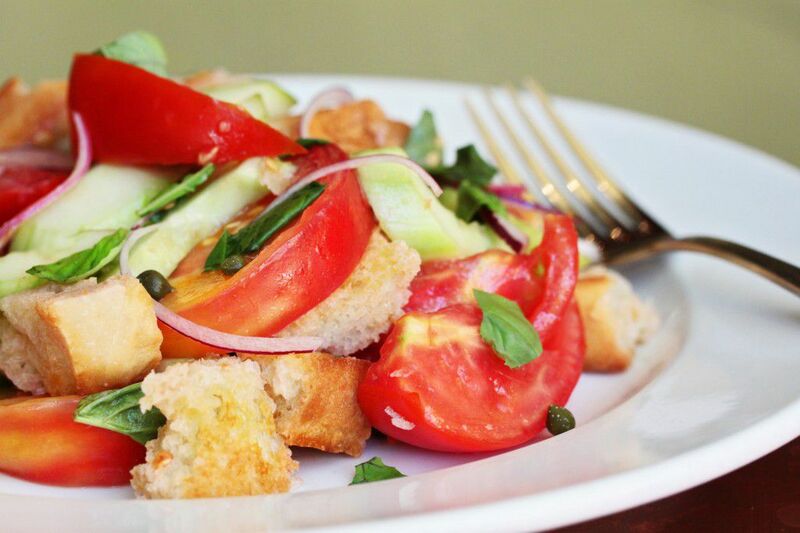 Savor the flavors of summer with this tasty Tuscan style salad! This delightful dish was served at Cafe Bernardo Midtown in celebration of Sacratomato Week last month. While tomatoes are the stars of this particular recipe, have fun and get creative by adding your own ingredients like olives, garlic, or anchovies. Remove all crust from bread and cut into 1” slices. Brush bread with olive oil and lightly grill. Tear, or cut, bread into 1” cubes. Peel, seed, & slice cucumber. In a medium bowl, combine tomato juice, red wine vinegar salt, & pepper. In a large bowl, combine all ingredients and dressing, except for basil.